Chitkul is a village situated in the district of Kinnaur in Himachal Pradesh. It’s the last destination in Himachal Pradesh where you can go without a permit as it is situated at Indo China border. City nearest to Chitkul is Rampur in Himachal Pradesh. Chitkul is at an elevation of 3450m. The climate of Chitkul makes it very special. It is covered by snow in winters and people living in Chitkul have to move away from it because of snow. The climate remains cold all over the year in Chitkul. Potatoes grown in Chitkul are one of the finest potatoes and are expensive too. Chitkul is at a distance of 569 km away from Delhi. It is the last Indian village with a border of China that is why it is under Indian Paramilitary Force ITBP control. Chitkul is a very cold and windy place and its roads remain closed by the first snowfall in November but it is best for enjoying the snow. Sangla is about 28 km away from Chitkul. It takes half an hour to travel from Dangla to Chitkul. If you are thinking to spend your holidays in Chitkul make sure you take adequate cash and fuel with yourself as Chitkul has no fuel station and ATM facilities. For medical help and emergencies, you have to go back to a Sangla that is about 28km away. Places to stay in Chitkul are expensive. There are wooden houses that are turned into hotels for tourists. Many tourists prefer to stay at Sangla and go to Chitkul for one day trip due to such expensive hotels. Baspa River: Baspa River is situated in the beautiful spa valley that rises near the Indo Tibetan border. It is the most scenic in the Himalayas. 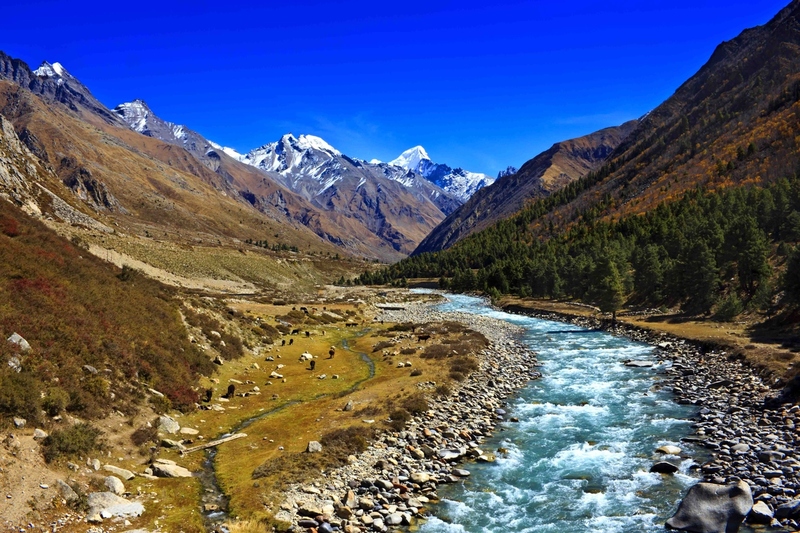 Water flows from perennial glaciers into Baspa River and it shares catchment with Ganga. Baspa river start from spa hills further join Sutlej River and leave its bank near Marcham. If you are planning an adventurous trip you can raft in Baspa River with many twists and turns. Mathi temple: If you are making a trip to Chitkul make sure you visit Mathi temple. This temple is dedicated to their local god Shri Mathi. The beauty of the temple lies in the idol of the goddess. It is made of walnut wood and is decorated by the tuft of the tail of yak. This temple was built 500 years ago. This temple attracts a lot of people towards it. It is at an altitude of 11262 feet. Sangla Valley: This valley is 28 km away from Chitkul. It is one of the best places to visit in Himachal Pradesh. Weather and sceneries of this valley make it more glorious and breathtaking. If you are thinking to have some beautiful and amazing pictures of your trip. This valley can offer you beautiful sceneries for your pics. Kagyu temple: It is one of the famous temples in Chitkul to visit. It is 0.2 km away from Chitkul. It has a beautiful and an ancient idol of Shakyamuni Buddha. The beauty of this temple lies in the four craving made at different directions of doors. Kagyu is the main school in Chitkul for Tibetan Buddhism. Rackham: It is 8.7 km away from chitkul. It has a magnificent trekking route moving along Baspa valley. Meaning of this valley is the stone bridge. There are two temples in Rackham dedicated to Hindu god Shiva and Maa Kali. It lies in the midway of Sangla and Chitkul. Bering nag temple: It is one of the famous temples in the Sangla. It is about 28 km away from Chitkul. There are many norms to visit in the temple that one has to follow. These norms are told by the priest of the temple. This temple is dedicated to the snakes that can be seen on the shoulder of Lord Shiva. This temple is believed to have many precious gems and stones. Temple is constructed beautifully with stones and woods. Dodital Lake: It is about 31.7 km away from Chitkul. It is at an altitude of 3117m. It is best for trekking and adventure. It is surrounded by nature all around the river, wildlife, birdlife, beautiful and dense forest of deodar trees. The trekking area of Dodital is of 22 km. It begins from Sangam chatty that is in Uttrakhand district. It is steep with an uphill climb and is above the sea level which makes it a panoramic natural beauty. 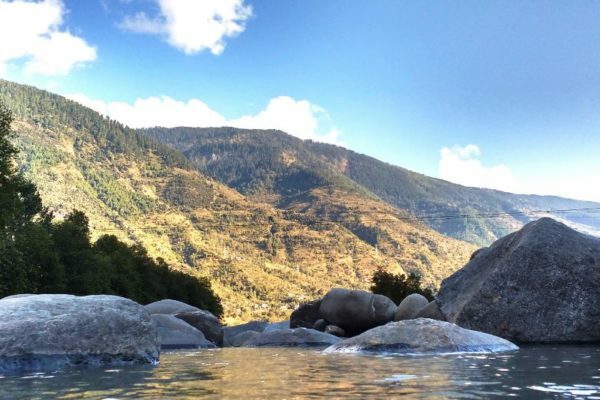 Make sure that you visit Chitkul with your family and friends once in the vacations and enjoy the mesmerizing atmosphere of these amazing places.